The space reflects the prominence of a world leader in the construction industry and offers flexibility and branding opportunities to display the full breadth of their capabilities. Hill International is a world leader in project management for the construction industry. 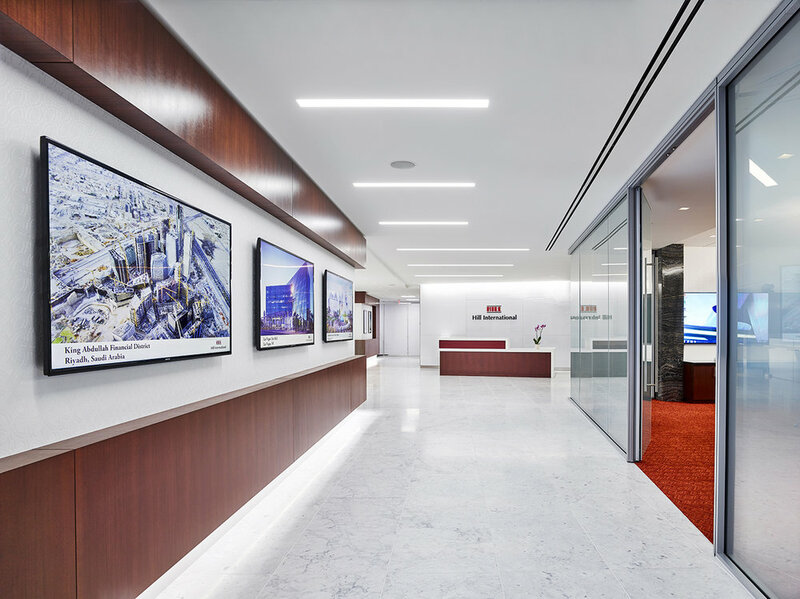 Hill sought to consolidate multiple offices and relocate to premier Center City Philadelphia office space, leasing two full floors at One Commerce Square totaling 60,000 square feet. The project required an aggressive schedule —10 months from award to occupancy. 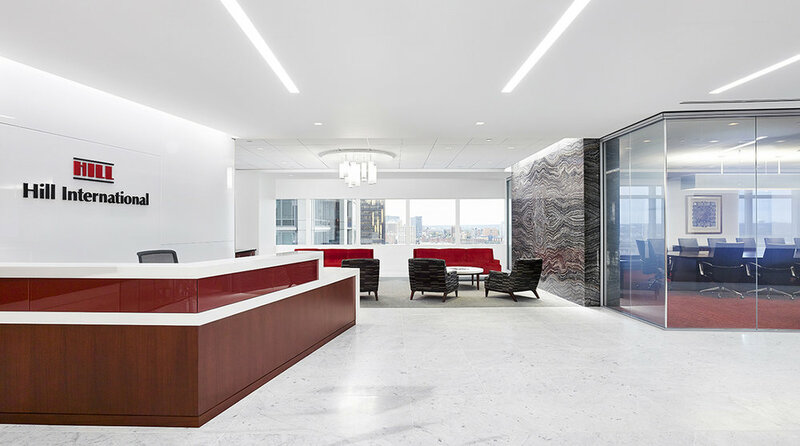 The design vocabulary reinforces the Hill International brand as a forward-looking company, utilizing a sophisticated and elegant palette of natural stone and rich wood elements. 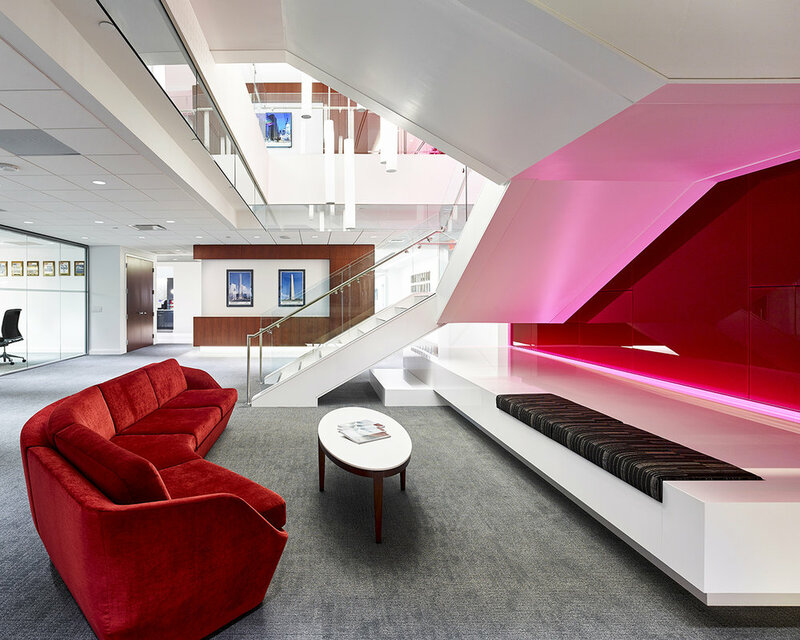 Key design features in the state-of-the-art space include a Hill International-branded maroon glass feature wall which extends from the main elevator lobby to the floor below; a custom two-story lighting pendant; and wood-paneled feature walls framing high-definition monitors displaying Hill’s extensive portfolio. An existing interconnecting stair was stripped down to the structure and re-clad with marble flooring and glass railings, providing a strong connection between floors. Demountable partitions were used on all office fronts and LED lighting was utilized throughout the entire space.This was a full renovation including schematic design, construction documentation, design and specification of all furniture elements, and artwork consultation.